Try the new V7 GXCHK report interface by clicking here. HyperKWIC is a tool for generating software documentation that combines the instant connectivity of hypertext with the analytical strengths of KeyWord In Context. It produces HTML documents that provide a fully interactive alternative to traditional documentation. 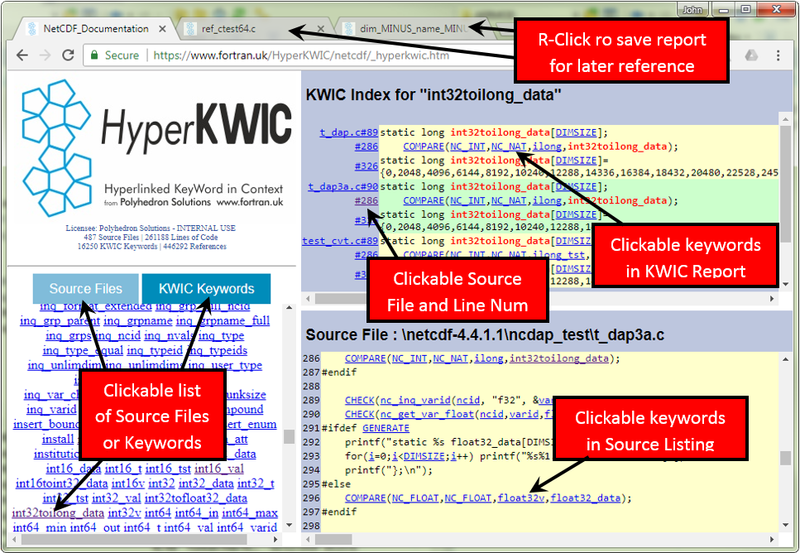 HyperKWIC may be used to document source code written in Fortran, C, C++, Delphi or any other mainstream language. You can interact with sample HyperKWIC reports for large Fortran and C programs by clicking here and here. HyperKWIC reports can be viewed on any system with a reasonably capable web browser, including tablets and smart-phones. Bugs in SPAG processing of WHERE and FORALL constructs and statements fixed. Regression in SPAG treatment of a complex inheritance scenario fixed. Improved error reporting in SPAG for some non-standard code. Improved SPAG treatment of C pre-processor code, including multi-line directives. It’s no longer possible for SPAG to write fixed form output with a left margin before column 7. SPAG no longer makes multiple copies of comments on lines with multiple statements. SPAG produces a message when code beyond the right margin is truncated and the default right margin for free-source form code is increased to 512. Improved error reporting when attempting to convert COMMON blocks to MODULEs. Manual updated to revision K.
A major update with many improvements affecting usability and compatibility of plusFORT. PFFE (the plusFORT graphical interface) is now available for Linux and Mac. New default behaviour for SPAG output files (restructured output, symbol files, coverage files, and module files). Instead of being written to the source directory, SPAG creates a subdirectory called SPAGged (or as specified in option 229 of spag.fig) and writes them there. Restructured output files have the extension .f90 (or .for if item 141 is set to 0) instead of .spg. If option 229 is set, items 230, 231, 232, 234 and 236 are over-ridden. The original (pre 7.10) behaviour is restored if item 229 is absent from spag.fig. Bug fixes in coverage analysis code to allow it to deal correctly with Fortran 95 modules. Probe routines rewritten and enhanced in Fortran 95 (in file probes.f90). Timing probe and report enhancements. SPAG copies probes.f90 to the output directory when instrumenting source for coverage analysis or dynamic analysis. probes.f90 must be compiled and linked with the instrumented code when creating executables for dynamic or coverage analysis. Default for SPAG configuration option 56 (location of INCLUDE files with no specified path changed to 1 (same directory as source file). New option for name of target executable in AUTOMAKE on Windows creates an executable with the name derived from the current working directory name. Manual updated to revision J. including a new section on PFFE. New "Per Symbol" reporting in GXCHK. Unicode output in GXCHK for improved rendering of call trees etc. environments with many directories containing INCLUDE files. than performing a simple merge.